Here’s every space we’ve been loving in 2017. The hallmark of a well-designed bathroom? A scheme that inspires a momentary escape from the established decor of the home. You’ll often find that it is the space wherein most opt to take a decorative leap, taking a chance on an overly ornate wallpaper or wall paint of a deeply saturated shade. Often enough, you’ll be working with limited square footage, meaning that each one of your design choices will have to hold significant weight. Ahead, we take a look back at the best bathrooms we saw all year, and the design tips we picked up along the way. File this one under one seriously creative take on a bathroom design scheme. Featuring a floor-to-ceiling tile, the intention of the space was for it to look like plunge pool. Stunning color aside, the concrete vanity and oversized display of greens truly help usher this bath into a whole new level. When you’re working with a tiny bathroom—or any small space, for that matter—you have a limited number of opportunities to make the decor stand out. Taking a bold design leap is definitely encouraged, especially if said leap entails a wallpaper choice as intensely beautiful as this. In this compact powder room, the custom wall covering was commissioned by Australian textile designer Louise Jones, and the result is all sorts of inspiring. From the periwinkle wall paint to the vibrant floor tiles of a similar hue, this cozy spot holds nothing back. Coupled with an ultra mod vanity and a colorful hand towel for a delicate touch, the overall aesthetic is pure perfection. As far as marble bathrooms go, there are a mere handful of ways to instill a bold and exciting touch, without compromising the elegant integrity of the space. A large scale piece of art of a saturated palette is surely one way to go. This monochrome spot gets a major dose of personality thanks to the bright wall art and chic, woven basket. Artist carly jo Morgan’s boldly decorated bathroom is anything but traditional. From the wood-paneled wall coverings to the sleek, claw-foot tub and chic landing pad, there are no shortage of wow-worthy elements found within the space. Our favorite detail? The ornate mirror, which undoubtedly steals the show. Perhaps one of our favorite uses of the up-and-coming pink and green color combo, this Australian bathroom exudes pure sophistication. 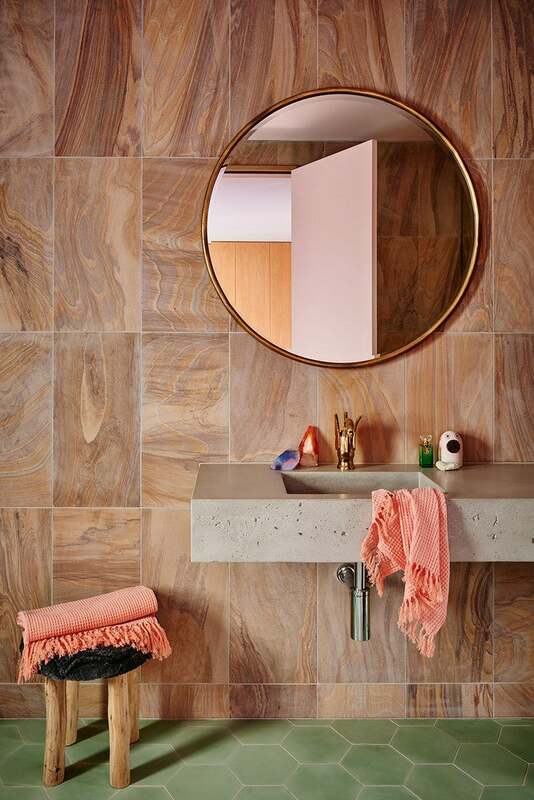 From the delicate blush tones of the wall tiles to the vibrant hue of the floors, the warm copper notes of the mirror and fixtures instantly elevate the existing scheme. Renovating on a budget didn’t mean compromising on style for Kara Vacca, the designer behind this minimalist home remodel. The design of this bathroom keeps things simple yet chic with an all-white decor scheme and warm wooden details. The area rug beneath the vanity brings in an added pop of color. LA-based interior designer Leanne Ford went with an all-white theme when renovating her 1945 farmhouse. In the bathroom, the whitewashed space especially helps pieces like the brass fixtures and large photograph pop. For those not afraid of a little color, take note. The fun wallpaper is all that’s needed for a bold bathroom, complemented with more subdued fixtures. It perfectly contributes to what owner Jessica Hendricks Yee describes as a “refined California-cool with a Frida Kahlo spirit” apartment. The gorgeous tile design in the shower is reason enough to book a stay at Greydon House. Using the shower as the main statement piece is a unique decorating approach that instantly makes this room stand out, and since the pattern is so bold, the rest of the decor can err towards the more modest. The bright and vibrant hues in our Spring issue cover star Jessica Walsh’s bathroom make the space feel young and cheery. But by relying on sharp lines and geometric patterns, Walsh ensures the space is more chic than childish. Now this is how to do black and white decor right! Designer Nicole Hollis created this sleek and modern master bathroom per her clients’ request using a marble countertop that really upgrades the room. Incorporating matte black in everything from the cabinets to the soap dispenser further ties the space together and makes the design cohesive. You wouldn’t know it, but this bright and airy bathroom is part of what was once a 1930’s fixer-upper in dire need of a makeover. It got a modern update in the form of geometric floor tiles and gilded details. Another hotel with impeccably-designed bathrooms, The Ned in London knows a thing or two about designing a standout space. With full tile walls in a pretty mauve shade and gold hardware, everything about this bathroom screams luxury. It definitely fulfills founder Nick Jones’ vision of a grand space with faded glamour reminiscent of its 1920s heritage. The stained and painted wood in this San Diego hotel bathroom lends a rustic element we’re obsessed with. The European-looking custom wallcovering —which according to designer Ginny Hightower was inspired by San Diego’s history as a Spanish mission— and modern marble countertop contribute to the eclectic appeal of the space. Published on May 2017. Updated December 2017.